Charlotte Martyr has also a site, here is the link if you want to see her creattions. Charlotte works in Lyon area, we have family there, so may be we will have the chance to meet one day ! 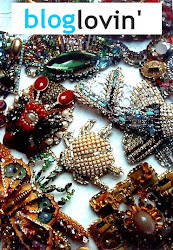 Just found this post on a Russian blog called moj-maskarad's journal, post is about sea creatures jewelry, and includes some of our pieces. Our friend Jane Aldridge from seaofshoes is pictured with her Hanna Bernhard squid necklace. I sometimes come accross articles and posts on blogs about our jewelry, so I have decided to show some of them here from now on, when they are fun and creative !